NOTE: This article is a Biological view towards fictional animals in the Zelda series. That means I don’t use magic and the goddesses as possible explanations for behaviors or adaptations. A basic knowledge of biology is needed to understand some terms in this article. Gorons can often be found in the Death Mountain region ever since Ocarina of Time. In the Zelda world the Gorons are strong fighters and good miners, but in the world of biology they would be one of natures evolutionary mistakes. If we examine this race closer, what is devastating for the survival of the Goron? One of the reasons why I compare the Goron with the Giant Panda is very simple. They both are large, peaceful animals who live off of a food source with very little nutritional value. Pandas have to eat 30 pounds (14 kilos) of bamboo to sustain itself. Gorons only eat rocks, but a rock doesn’t contain organic substances needed to build proteins, fats, or even DNA. The only way that the Goron could survive off this diet is by photosynthesis or chemolithotrophy (the ability to make organic substances from inorganic substances by chemical reactions). Since Gorons don’t have green pigments needed for photosynthesis, chemolithotrophy is the only option. Only some micro-organisms use chemolithotrophy to survive, so the Goron needs to have a symbiotic relationship (a relationship between organisms that benefits both) with a micro-organism to make his diet sort of possible. This necessary symbiotic relationship means that the Goron has to eat rocks that are useful for his symbiont (like sulfur-rich rocks), therefore making his diet very limited. Ocarina of Time showed that the Gorons had a very limited diet, because they could only eat rocks in Dodongo cavern. The Goron can’t adapt quickly to new types of food because of the symbiotic relationship he has, making a simple boulder blocking the entrance of their food cave disastrous. Overall, the weird diet of the Goron isn’t helping him in the struggle for survival. Where Do Goron Babies Come From? It is still not clear if Goron females exist. It could be that the male and female look the same, which isn’t uncommon in the animal world. The fact that Gorons call each other ‘brother’ makes the gender question a bit difficult, but since there are Goron babies/children there has to be some form of Goron reproduction. One of the options I can think of is asexual reproduction by cloning. Like yeast, the adult Goron grows a large lump of rock on his body called a ‘bud’. After some time, the bud falls off and is a Goron baby. There is no evidence that this budding is the way how Gorons reproduce, but it could explain the almost identical look every Goron has. The main character Gorons in the Zelda games have a different look, but that can be explained by mutations of the genes during the budding process. One benefit, you don’t need female Gorons. One downside, the lack of genetic diversity limits the Gorons adaptability to changing conditions. 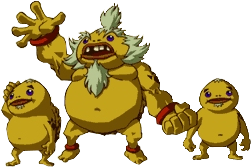 Next to the unknown reproduction cycle of the Gorons is the small number of Goron children a problem. There are only one or two Goron children in a Zelda game, which could indicate that the reproduction cycle is slow. A slow reproduction cycle is a dangerous gamble for highly specialized organisms. This is another reason why I compare the Goron to the Giant Panda. The reproduction rate of the panda is very slow with only one cub a year. If the cub dies, which happens often because the cub is very vulnerable, a whole breeding year is wasted. If Gorons share the same slow reproduction rate as the Giant Panda, it could be a danger to their survival. Gorons live on Death mountain or in some games (Phantom Hourglass and Spirit Tracks) in a mountain rich area with lava in it. These habitats aren’t the most animal friendly, so the Goron needs to adapt. For example Gorons have tough skin, protecting them from the heat and falling boulders. The large amount of adaptations that are needed to even live in the environment gives the Goron an advantage, because they are the only species that can survive in the mountains. There are also downsides to these extreme adaptations. It makes the Goron so dependent of their environment, that every small negative change in the environment is deadly. 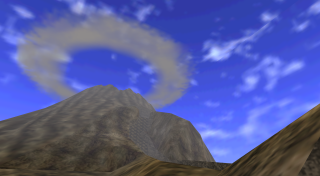 I already mentioned Ocarina of Time, where the Gorons lose their feeding grounds because of a large boulder. In Majora’s Mask, the rapidly changing climate makes the habitat too cold for the Goron. The Gorons weren’t in danger in Twilight Princess, but if they left the Death Mountain region, the Gorons got exhausted because they needed special hot spring water. The Goron really is an interesting animal. From the habitat to the unknown reproduction cycle, all the adaptations are extreme enough to call them evolutionary wonders. Sadly, most of the adaptations are a bit too extreme to be likable. The highly specialized diet needs a symbiotic relationship with micro-organisms, but this can make the diet so specialized that it isn’t possible to find proper food. Although the reproduction cycle is unknown, it could be possible if the Gorons reproduce asexually through budding. This asexual reproduction cycle limits the diversity of the genes, which can be a major disadvantage when new adaptations to a changing habitat are needed. Also, the lack of Goron children could indicate that the reproduction cycle is slow, making the Goron more vulnerable as a species. Last but not least, the habitat itself asks for extreme adaptations making it a very difficult place to live. The Goron has the advantages needed to rule the habitat, but if the habitat disappears or changes, the Goron is first to go extinct. Basically the Goron is a perfect example of dead-end evolution, just like our furry friend the Giant Panda. If the World Wildlife Fund ever decides to use another animal for their logo, the Goron would be a good candidate.